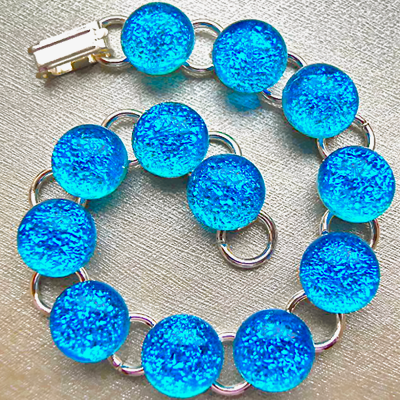 This beautiful bracelet is made with 12 shimmery iridescent Turquoise Dichroic glass pieces. The bracelet is 20 cm long including the catch. Each of the 12 glass pieces measures 1.2cm and they're made of two layers of glass. A layer of sparkly Silver Dichroic glass topped with a layer of translucent Turquoise glass. The bracelet is made of good quality plated silver and has a fold over catch, and it comes in a bracelet gift box.